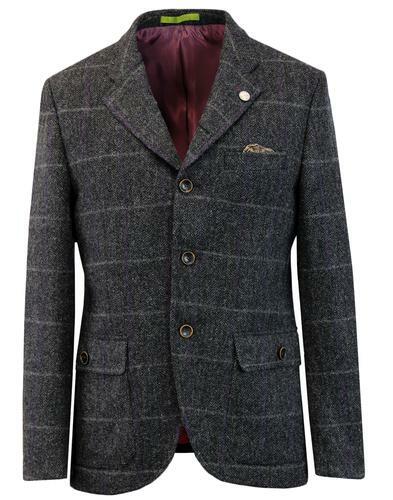 Gibson London 'Grouse' Men's Retro 3 button Blazer in a stylish charcoal herringbone check. Blending Vintage country heritage styling with classic tailored 1960s Mod touches, the 'Grouse' tweed herringbone blazer by Gibson London offers a smart and refined look to your seasonal wardrobe. A hint of Ivy League style with button down flap pockets to sides and a rich Retro check enhancing the classic herringbone ground. Corduroy under collar trim accentuates the country gent vibe. The cool Retro pocket watch lapel pin finishes the garment off in style. 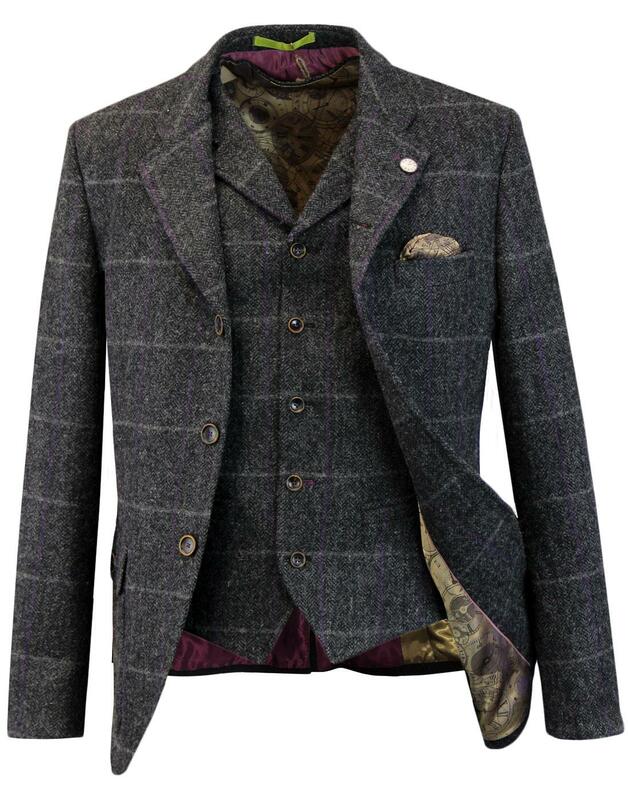 Pair the Gibson London 'Grouse herringbone windowpane check blazer' with matching 5 button, high fasten 'Tyburn' waistcoat for a truly dashing and debonair Mod look. - Gibson London Men's 1960s Mod 'Grouse' 3 button blazer in charcoal. - Retro textured herringbone fabric in charcoal with contrast windowpane chalk stripe check. - Psychedelic 1960s pocket watch lining. - Vintage wood effect buttons. - Tailored Mod notch lapel. - Retro button down flap pockets to sides. - Single non-working button to cuffs. - Left side breast pocket with pocket square lining. - Retro textured winter weight wool fabric. - Ornate pocket watch lining. - SKU: G17235GR Grouse Herringbone Check Blazer. Composition: 100% Wool. Lining 1: 50% Viscose, 50% Acetate. Lining 2: 100% Viscose. Lining 3: 63% Viscose, 37% Acetate. Gibson London 'Tyburn' Men's 1960s Mod wool herringbone tweed check waistcoat in charcoal. A refined Retro look is guaranteed with this sartorial masterpiece. Mod high fasten tailored waistcoat with slim notch lapel and dashing seasonal textured herringbone fabric that pitches subtle flashes of colour with a Vintage tweed herringbone ground. The intricate pocket watch interior linings add a hint of extrovert style to this traditional gentlemen's country heritage waistcoat. Match this 'Tyburn' herringbone windowpane check waistcoat with Gibson London's 3 button 'Grouse' blazer to create a sophisticated Mod look. 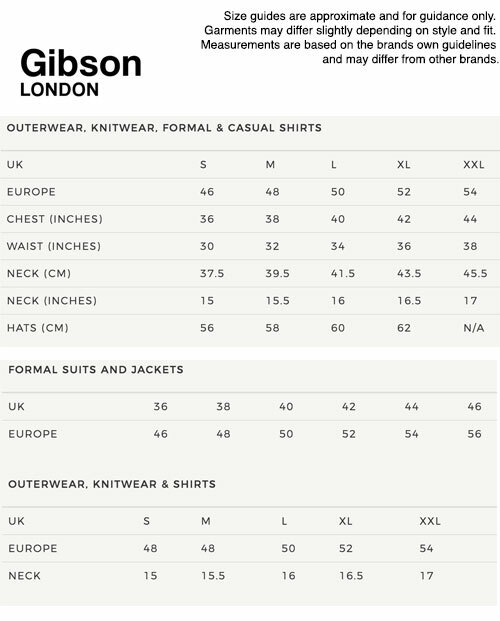 A waistcoat that will stand the test of time - 'Tyburn' by Gibson London! 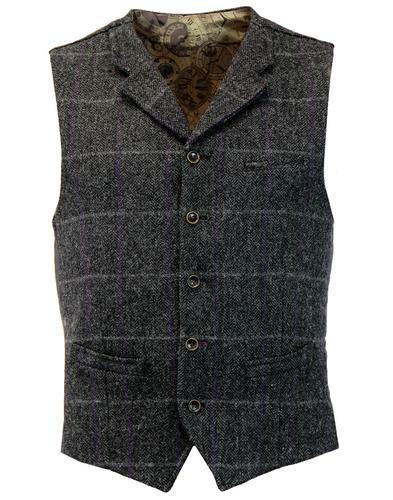 - Gibson London 'Tyburn' men's retro wool herringbone windowpane check waistcoat in charcoal. - Retro textured pop colour check design on charcoal herringbone ground. - 5 button high fastening. Vintage wood effect buttons. - Satin like back panel with retro tab adjuster. - 1960s psychedelic pocket watch lining. - Pockets to sides. Left breast pocket. - Winter weight wool fabric construction. - SKU: G17235TB Tyburn Herringbone Check Waistcoat. Composition: 100% Wool. Lining 1: 100% Viscose. Lining 2: 63% Viscose, 37% Acetate. Lining 3: 50% Viscose, 50% Acetate.